Examples help us pull concepts together and see how those concepts apply to actual problems. And, that’s my goal for this eBook. Throughout the book, you’ll find a number of links to blog posts I’ve written, or other helpful websites I’ve found that explain a concept I used to create an image. And, many more lessons I’ve learned from making these images! Each image and story is presented on the same page, so with the table of contents and everything, the book is a total of 30 pages. Buy the eBook now for just $9.95! I realize that not everyone enjoys reading eBooks on their computer screens (or if you’re lucky, an iPad! ), so I decided to offer this book as a magazine style print edition as well, through the MagCloud print-on-demand service. The print edition is printed on high quality magazine style paper, and is available for $15. Note: Since I’m using a “print-on-demand” service, it may take up to two weeks to print and deliver the magazine. Although, most orders take less than a week. Feel free to use photos from the book to help with promotion (check out this set on Flickr for higher resolution versions). Note: this affiliate program only applies to the eBook version–it is not available for the print edition. I can’t wait to read/see the book! Excellent book! Love the story of each photo. The preview is gorgeous! I’m your neighbor here in California and have always loved the flora and fauna of this beautiful state. Cheers to you for putting this together, I’m impressed by your professionalism and candor. Cathy / Nikhil – thanks! Congratulations Steve! The preview of the book looks amazing! Love the book! Can not beat the price. The concept is great sharing experiences is a great way to learn. PS. Love the links in the book as well. Great resources. @Ani – thanks for your nice comment! I’ve been a professional for over 15 years, photojournalism, and I can tell you one thing: I love reading your site. The articles are informative, straightforward, easy to understand, and very helpful. Thanks very much for the generosity you extend throughout this site. I’m new to the digital photo world and your tips are greatly appreciated … within a few minutes of discovering your site I purchased “Examples” and I am delighted with each example and will find myself thinking of your words as I try to track down some Hépatique trilobée (not sure about the spelling) tomorrow morning. BTW I started to leave a comment earlier and it ‘went away’ (pilot error I’m sure) so my apologies if another similar comment appears. 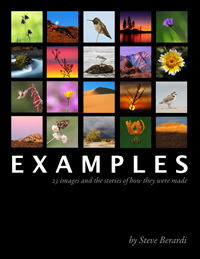 Interesting ebook and very useful for nature photography. BTW, if you take a trip to Costa Rica, do not forget to bring your camera and lenses. It’s a natural paradise for a nature photographer like you. I am looking forward to read your book. I noticed that this site is selling it for $8 but the example states it is $7. Either would be a great price but though that it should be consistent and someone might want to know the discrepancy. Glenn – Thanks a lot for pointing that out. I just recently changed the price of the book, and forgot to update it in the preview. Thanks again!